Which field is that cow in? I reader of one of my earlier posts, Copy Data from one Shape to Another ( see https://davidjpp.wordpress.com/2009/02/02/copying-data-from-one-shape-to-another/ ) asked how a cow can inherit the field number of from the field that it in. I think that this is just an example of how you can automatically update any Shape Data value from an underlying container, but I will use a cow in a field example anyway. This example uses VBA code, but should be good to use in any version of Visio since Visio 2000. I created a field shape, actually just a filled green rectangle with a brown dash line, with a single Shape Data row, Prop.FieldName. 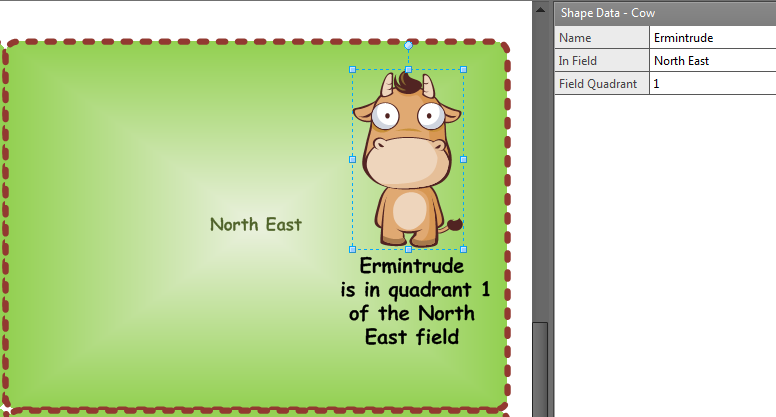 I also created a cow shape from Clip Art, and added two Shape Data rows, Prop.Name and Prop.InField. I also added an optional third Shape Data row, Prop.Quadrant, to add extra precision, if required. Thus, you can see which field the cow is in, and even which part of the field. 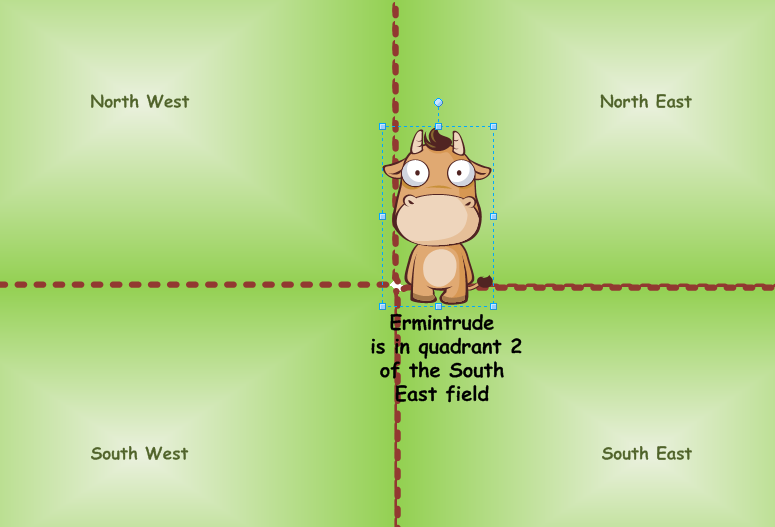 Obviously, you can type in the name (and quadrant) of the field that the cow is in, but you want it to update automatically whenever a cow is dropped into a field; moved between fields; moved out of any field; or even if the name of the field is changed. To do this, I added a formula in the EventXFMod cell of the Events section of the Cow shape. This is a call to the GetContainerProp macro with the parameters Prop.InField , Prop.FieldName and Prop.Quadrant. The VBA method, GetContainerProp , is based on the ListShapesThatContain example in the Shapes \ Spatial Neighbor List in the Visio SDK Code Samples Library. 'that meet the criteria set by the arguments. 'the arguments of the method. "=GUARD(" & vsoShapeOnPage.NameID & "!" & containerProp & ")"
vsoShapeOnPage.NameID & "!Height * 0.5) , 0 ))"
This code works by utilizing the Shape.SpatialNeighbors property to get a list of the shapes that the cow is contained in; touching or overlapping (these are the Relation parameter). Each shape in this list is checked to see if has the required container cell, and, if it does, the Shape.HitTest method is used to check that the feet of the cow (its PinX and PinY) are in the field. To have a closer approximation of the cows feet position, and changed the LocPinY of the cow shape to be Height*0. It is worth noting that the default for the SpatialNeighbors property is to include Visible geometry sections, and in the case of the imported Clip Art image that I used, it worked because a Geometry section existed with Geometry1.NoShow = FALSE, even though there is no fill or lines. There two cases that are not covered by my example, namely, when a field is deleted or moved away from any cows that are in it. The latter case can be handled by fixing the PinX and PinY of the Cow to be relative to the underlying field, but the former case needs code to react to the missing field. This can be done, but is beyond the scope of this post. In any case, I would recommend using events in an Add-In (usually vb.net or C#) for a more complete and robust solution, since lots of simultaneous individual calls with CALLTHIS() in VBA will degrade performance at some point.